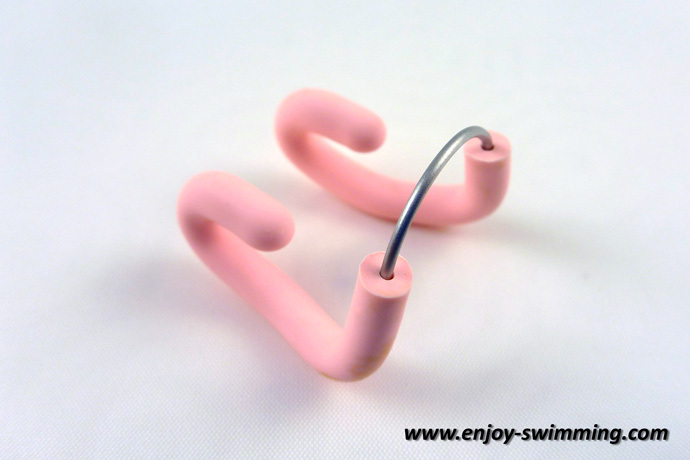 Nose clips (sometimes called nose plugs) are small devices that allow you to keep water out of your nose while swimming. They are especially useful if you are a beginner and haven’t yet mastered the breathing technique of a particular swimming stroke. First, there’s the basic nose clip. It’s made of an u-shaped nosepiece with padded ends to avoid cutting. The nosepiece is made of stiff wire or nylon, and the pads are made of latex, silicone or TYR. The u-shape of the clip pinches both nostrils together so that it sticks on your nose and keeps water out. Second, there are nose clips featuring a strap made of latex. This strap attaches to both ends of the nosepiece. The strap helps to keep the plug in place while swimming. It also prevents losing the nose clip in the water when you remove it from your nose. Fitting a regular nose clip is rather easy to do. Just push it against your nose with the bridge facing upwards. Then push the ends against your nostrils to pinch them. Use a similar method to fit a strapped nose clip. Move the strap over your head and behind neck once the clip sits on your nose. The easiest way to do it is to first put on your swim cap, then your swim goggles and finally the nose clip. Are Nose Clips With or Without a Strap Better? Personally I prefer strapless nose clips because fiddling with the strap is cumbersome. Furthermore, the strap tends to break after a while, rendering the clip unusable. On the other hand, regular nose clips stick to the nose well, even without a strap. I can’t remember having lost mine while swimming. Finally, I prefer the look of strapless nose clips. 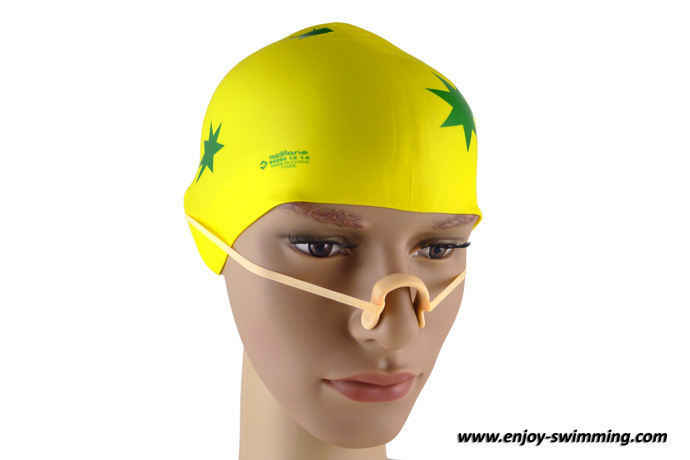 How about breathing without nose clip in surface dives? Today at the pool I just paid attention to what I do. When surface diving, I just take a deep breath before diving, and then exhale a few bubbles through the nose while diving. How do I wear the Speedo profile nose clip? You wear it in a similar way as a regular nose clip. I didn’t like the article. It mentions nose plugs and all it talked about was nose clips. I am looking for nose plugs. If you are gonna be specific, be informative, not vague. I hear enough vague-filler talk on the news already. You are correct, the term “nose clip” is used more often than the term “nose plug” in the context of swimming. I have updated the article to take this into account. Nose plugs and nose clips are the same thing. Some suppliers just label them as nose plugs while others label them nose clips. There is no such think as a plug that goes up your nose. A few synchronized swimming teams experimented with plugs placed inside the nose but it is very dangerous to do so as they can become lodged inside your nose. Grew up using these wherever I went swimming. Most children wore them swimming. Perhaps we should have children & adults wearing them again. I think it could help keep the amoebas out of noses. Thanks for the write up, I completely forgot how to wear them. Thank you! Thank you for this article. I am about to purchase a nose clip and learning how to wear it will help me pick out the right one for me. Do nose clips stay on jumping into water? We’re about to do the tough mudder in a few weeks. One obstacle involves a 10 ft or so jump into a pool. Trying to hold my nose last year didn’t work, just afraid of the impact/pressure knocking it loose. I am looking for nose clips that my grandchildren will wear. We swim in lakes and do a lot of skiing and tubing. Of course like a lot of people I have a lot of concern about the amoebas.